Thought it would be interesting to see what people here think of the demo. Oh well, guess I'll try the PC version tomorrow. So far, it seems great. The save system seems a little wonky, since the one time I tried to use it it loaded only the background and refused show the dialogue, characters, or even the bar with the dialogue and Tom's face on it, but I just started from the beginning again. I also noticed that it seemed to refocus every couple of screens. Not sure if that's on purpose, and can't be fixed, or is a bug, but it was mildly irritating (little things like that irk me, but I'm just weird that way). Nothing that ruined the experience for me or anything, just thought I'd mention it. I keep getting reminded of Katawa Shoujo, and dem feels are coming back. Pinkie really reminds me of Emi, with the hairstyle and all. I think it's a good thing. A lot of people I know got into VNs with Katawa Shoujo, and like I said, I have some pleasant memories associated with it. Feels a little nostalgic. I just finished going through the entire demo, and so far, I must say that I absolutely love it. The art work is phenomenally well done, the music is absolutely perfect, and the story is amazing. Actually, nearing the end of it, it reminded me of something. As Tom was on his own in his room, alone with his thoughts, I couldn't help but notice that is almost exactly what went through my mind as I left home to enlist. Of course, the military being far more strict (and living with ~50 other dudes), is much different from high school. But, my thought process was relatively similar. Anyway, great job. I look forward to the finished product. Hell, I may even go through the demo a few more times before it gets released. Thanks for the awesome product. I just played through, and it looks great. Love the music especially. A first I was worried about a slight lack of variety in sprites and music, but then I remembered the disclaimer about how several are placeholders. The writing was great, with all the characters feeling like themselves - I especially love how Pinkie keeps getting up close and personal. Is Derpy going to be holding all the little odd jobs on and around the school? That would be so great. I can hear the narration already: "How many jobs does this girl have? Can she even have time to sleep?". Thomas Daniel Stone. Just perfect. Oh, I found a small bug: in the middle of the RD conversation, the cursor is moved to the center of the screen. Just finished trying the demo. The characters are great, the art and design is beautiful, and the writing (aside from 1 or 2 typos) is fantastic. I look forward to seeing what happens in the finished version, I know everyone who's working on it will do an amazing job. Man that was pretty great, the art was really well done and the music was great aswell. Only a few typos, but meh, that's nothing important. I enjoyed it a lot, that's my judgement. 1. The story started with a bunch of vague, introspective narration. I think it would be better to start with an event happening (two people talking, or action). 2a. What sort of school did Tom attend? 2b. Where did he live? 2c. Why travel by train? 3a. Tom and Twilight already know each other at the beginning. When FIM began, Spike and Twilight already knew each other. Though their relationship is more like mother-son or siblings. 3b. Also, it seems both Tom and Spike like to sleep. 4. I'm a little surprised by how large AJ, Rarity, Derpy, Pinkie, *and* Fluttershy's cup sizes seem to be. By comparison, Twilight's body looks slimmer, and Celestia's body is appropriate for an adult. That said, it's your choice as to how you draw humanized characters. Their canon ages are vague, and of course this story is only loosely based on FIM. 5. I didn't expect the zoom effect when meeting Pinkie. Maybe it's because I've been following the English visual novel community for years, and I'm still surprised when anything looks better than Amatire. 6. I'm not sure if I like side portraits. It looks like they're identical to the characters' on screen expressions. A nice option, I guess, but not essential. 7. I suppose it's appropriate that Tom's surname is "Stone." And is the "Daniel" middle name referring to a certain well known FIM composer? I think an important thing to do would be to make model sheets like this http://ghostwriternext.deviantart.com/art/Fabienne-The-Hedgehog-Model-Sheet-392105445 to keep the character designs consistent. Finished playing through the demo, really great stuff. I can't wait for the full release! Few small things that jumped out at me as I played through. When it says Twilight is fast asleep on the train, the image is of her just standing there with eyes shut. I'm guessing this is a placeholder, but if it's not I'd highly recommend taking the time to do one of her lying down on the seat. The music is great, but it doesn't quite loop properly, once the song finishes it cuts off at the end and has a small pause with no sound then starts again, rather then having a full fade out/in, or an instant loop back to the start. There's a few gaps where no music plays, again I'm guessing this is temporary. But if it's not, get something in there! This is a small detail, but I feel like in some of the longer scenes, the image becomes too stagnant, something as simple as adding in a blink animation, or maybe have some subtle changes in the background so that the image continues to move. More of a question, will there be actual dialog options? So far in the story, there hasn't been any choices. Will we get the option to play through a few different ways, or is Tom's storyline pathway set in stone? Oh and in the scene at the end of the demo where Tom makes it to his room, it mentions his bag sitting on the bed, but the image has his bag next to his desk. I found it a bit off-putting. Maybe add an extra image of some bags sitting on the bed, just for that scene, then remove them later? Or an easier option would be to just change to text so it says his bag is next to his desk. That's about it! I'd just like to say again how amazed I am by the quality of this project. When I first saw it several months ago, I was expecting some short, half-assed attempt, but just the demo has already exceeded those expectations! Continue the great work and I look forward to hearing your updates. [*]More of a question, will there be actual dialog options? So far in the story, there hasn't been any choices. Will we get the option to play through a few different ways, or is Tom's storyline pathway set in stone? Especially considering the demo was just part the first chapter (I think), and is unfinished with placeholders. I thought the demo was pretty awesome. Really great artwork in particular. 1. In the first conversation with Derpy, her portrait appears much lower than Toms. It's a bit weird seeing Toms portrait with head, neck, and shoulders, and then it switches to Derpys image only showing her head. I guess that's to show that she's a lot shorter? 2. A couple of small grammar errors in the office scene with Celestia. Tom says, "It's not that I don't have ambition, it's more like... I don't [know] where to aim it." And a little later Celestia says "Applied studies will give(s) you classes focusing more..."
"...some classes fit into all subjects, and other[s] are mandatory." I know this is being really pedandic but it's little details like this that can spoil a great game for me. Anyway, keep up the good work, I'm looking forward to the games final release! I like it. I've only played two visual novels ever so I'm really looking forward to this one. I so far really liked it. For a relatively low budget(?) and being completely free it is beautifully done. The writing is great but what really hooked me was the music and beautiful artwork. Serious kudos to the artist(s) who's on the team. I've read a small amount of VNs and this shows a lot of promise to be one of my favorites. I can't wait to see the finished product also the portraits zooming in and out is a pretty awesome touch. Haven't seen a VN do that so far and it's quite a fun touch to reading and interacting with the characters. I enjoyed it a lot. Tom was more likeable than I thought he might be. He's unsure but not completely helpless. The artwork is excellent. I like how it can be scaled to full-screen without loss in quality. I liked Derpy popping up around the place too. It seems like a good school too—a place where I wouldn't mind spending a lot of time at. 1. Some more poses for the characters. 3. The writing is good but I think the start should be compacted or have some indication of progress happening. The black lasts for a little too long. Maybe images of the long distance the train is going. So, I'll be the crazy guy and complain about, *GASP*, the MUSIC! Yes, I have a complaint. What kind of complaint? My sound level was adjusted to the first sountrack to pop by. The second one's harp started so loud that it startled me. Throughout listening to said soundtrack I was under the impression that the harp in the right ear (it was a harp, right?) was just too loud compared to the other instruments. Obviously I'm no musician so this is a player's perspective. But, devs, I urge you to take note of it and every other non-positive comment to come along. Might be one of us devil's advocates is on to something. That said, loving what you have so far. I do hope some small level of voice acting can be included, as I loved the trailer voice acting for Twilight and I think she would do an amazing job in general. Oh, one more thing. At the start, the text there was kind of long and arduous. At a point I felt like my time was being wasted as I became uninterested in Tom's thoughts. Spice it up? Make it a bit shorter? I'm just making remarks and suggestions, not claiming to KNOW things here. We may not respond to every post, but I make a note of every major issue people have. How did I forget about my biggest issue?! Geez, I knew I should have written it down somewhere. Okay, so my biggest qualm with the beta was the text. Playing it I had an experience I never had before, which was that I kept having too look away from the characters! Now, obviously, you need to to read the text. 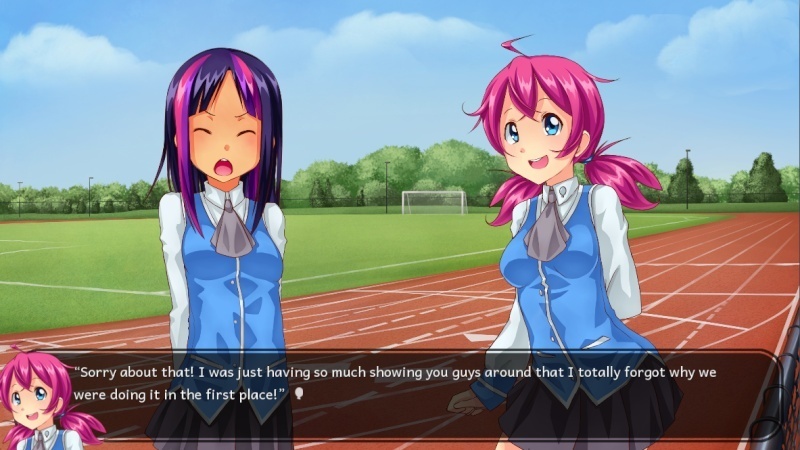 But in the demo this was significantly more so than with other VN's. 1. The text is awfully far to the left for where characters usually are. 3. The text is very small in size for said distance to the faces. My preferred state would be where I could read the text at a glance and not feel like I have to wait with reading just to make sure I caught all the expression changes. I noticed that after you finish talking with Rainbow for the first time then mention that you need to be at the headmasters office. "Sorry about that! I was having so much showing you guys around that I totally forgot why we were doing it in the first place!" Shouldn't the word fun be after much? Let's see, what to say about my initial impressions of the demo excluding the music. I really enjoy the artwork and and character designs. For me the conversations or writing were easy to follow and enjoyable to read. It wasn't very text heavy (thank god). Personally I felt Tom was relatable. Tom is best rock. Sorry about that. But one problem is the loading. I loaded one save file and pop out a background and character portraits. And that's it, no text boxes and no way to progress the game. I guess that is it, Im not very good at giving critique. Overall, for me the demo was really good, can't wait for the full version. Will there be VAs implemented in the final game? Will the visual novel have multiple endings with choices being critical or is it a linear story progression? (Silly question) Will there be a prom if this is Tom's senior year? So yeah, keep up the good work you guys. Other than the occasional typo (which was to be expected of an unfinished product anyway) I really don't have any complaints so far. >w< It's beautimous! Keep up the good work, friends! The graphics are very reminiscent of K-on in my opinion, which isn't bad. It has a very "moe" feel. However the shading, on the breast, in particular is awkward and it feels like the perspective is a little confused. I don't expect this to change this late in development. Just for your info. The music isn't bad, but it has a very noticeable flaw in that it either needs A) to be longer or B) to loop better. Nothing like hearing the music loop, obviously, multiple times in a long meaningful conversation. This is where I might start sounding douche-y. In my opinion the writing sounds like it's trying to be Japanese, like other VNs, but feels like it's written by westerners. It comes off as weird and awkward. There were several behavior issues that I had, the biggest when Pinkie asked Tom's name and he asks "My name?" Who the hell else would she be talking to? Then moments later the same thing happens with Twilight. There were more of these. Certain things were said, that would never be said. Such as "I need to be unconscious now." No one would ever say that. It sounds weird and wrong. I do have certain biases and I thought I'd lay them out. First I don't like dark Twilight, I don't think she's to dark here which is nice. Second I hate large breasted Fluttershy. No really I hate everyone who draws her well endowed. I personally don't think it's fitting. Having played a lot of VNs myself there is a certain length:arcs:choices ratio I really hope that you can get it down. I know I may not sound like it, but I am looking forward to reading this. I want you guys to succeed. On the music I agree with you but I think they said that the music in the demo is a placeholder. As far as the well endowed Fluttershy (I'm all for it ) I'm just glad they are all different and not sharing the same body type. On that note, I don't actually hate anyone. Different body types are fine, good even. I just don't like Fluttershy getting the large breast. But who am I to judge, and we're all looking forward to this VN anyways.